One of the least understood processes within the framework of plate tectonics is the mechanisms for continent-continent collision, yet this process plays a critical role in the development and growth of the continents on earth. This project is aimed at understanding the mechanism of continent-continent collision along the Eurasian-Arabian plate boundary in eastern Turkey. To this end, we deployed a temporary 29 station broadband PASSCAL array in eastern Turkey. In August of 1999, we began site selection and were able to locate safe and stable sites for nearly all of the stations; all station sites were ready for deployment in mid-September 1999. In late October and early November of 1999, two teams of three to four people each (including two PASSCAL engineers) deployed two stations a day. The entire array was installed in approximately two weeks. Most stations were powered by solar panels, though six stations located on the Anatolian plateau and subject to rough winters were supplied with continuous AC power. To see some field pictures, click here. To ensure proper operation, we visited each station two to three weeks after installation in November 1999. Most were working well, though we did encounter a few problems with solar panel power at the easternmost end of the array. Using Linux laptops, we were able to perform all quality control in the field. Earthquakes in and around the region as well as at teleseismic distances were recorded. To ensure maximum data recovery of local, regional and teleseismic waveforms, we recorded 24 bit broadband data continuously at 40 sps (samples per second). Using PASSCAL's 4.1 GByte field disks and the REFTEK 72A's data compression algorithm, we visited the stations every 3 to 4 months. The last data were collected August 9, 2001. The data from this experiment were jointly analyzed by the two institutions. Follow this link for the full text of our report in the IRIS Newsletter. The Bitlis suture/thrust zone and the East Anatolian strike-slip fault mark a distributed, irregular, and young continental collision zone. This collision zone is further characterized by a topographic high that is actively deforming. 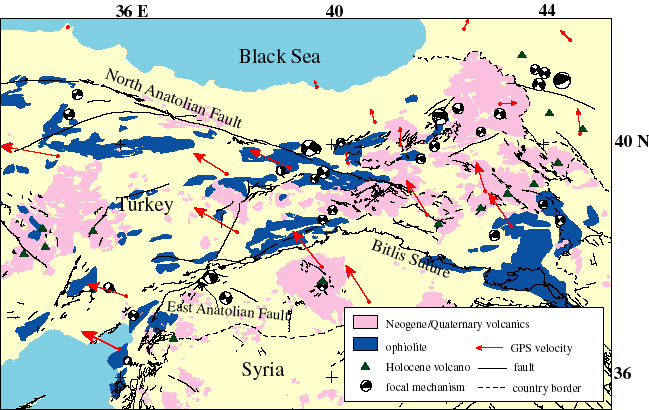 Tectonic escape is taking place to the west, as evidenced by the right-lateral strike-slip movement along the North Anatolian fault system and with left-lateral movement along the East Anatolian fault system. The combined rates of slip along these two faults is 0.9 cm/yr for the escaping Anatolian block. This rate of westward slip does not account entirely for the strain induced by the 3.0 cm/yr convergence of the Arabian plate with respect to Eurasia. Therefore, this deformation must be accommodated elsewhere. The age of the collision ranges from 12 Ma, based on stratigraphic discontinuities in Eastern Anatolia and the beginning of collision related volcanism, to 20 Ma based on the convergence rate of the two plates. The discrepancy in age is not easily reconciled given the current available observations and geodynamic models. 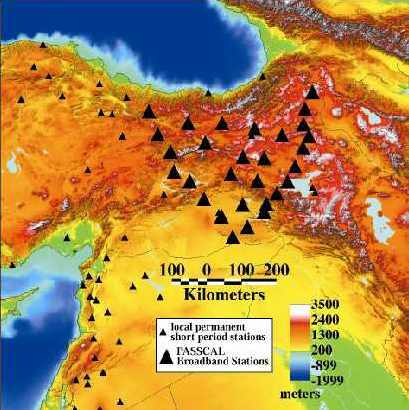 The collision zone between the Anatolian and Arabian plates is a very complex and diverse tectonic terrain . In order to fully understand this collision zone we must combine our seismological results with the large number of geologic studies that have been completed in this region (geochemical, geochronological, GPS, etc.) into a single database to produce the most reliable model of the geodynamic processes occurring in this complex region. Cornell's Middle East and North Africa GIS databases (see web site: http://atlas.geo.cornell.edu) provide an excellent starting point and mechanism for this data synthesis and integration. 1. Is the Arabian plate being subducted, delaminated, or neither? A number of geodynamic models have been proposed to explain the Arabia/Anatolia continental collision zone. Our experiment searches for evidence and support for any of these models. Alternatively, new models will be developed as the data and observations call for it. 2. Is the Anatolian plateau supported dynamically or isostatically? The crustal thickness in Eastern Anatolia beneath the Pontite and Taurus mountains is poorly constrained. There are no seismological or geophysical observations to constrain the crustal thickness. Analysis of broad band seismic data will determine whether the topography in this region is supported isostatically or if a dynamic model is required for compensation. This experiment greatly improves our knowledge of seismicity in this region by providing a much improved seismic velocity model with which we can more accurately locate earthquake hypocenters. This experiment will record a much larger number of earthquakes, their locations will be much more accurate than generally accomplished in this region. See pictures taken during our IRIS/PASSCAL training and fieldwork. Project sponsored by the National Science Foundation. For questions or comments, please contact Muawia Barazangi: mb44@cornell.edu.